For those who have been injured in a motor vehicle accident in Ontario; any financial compensation obtained by a negligence lawsuit will ultimately be based on the plaintiffs principle of loss. Those who have been seriously injured in a car accident by the negligent actions of another, are in essence entitled to recover all expenses and losses which have been reasonably incurred as a result of their injuries. This is likely to include: loss of past and future earnings, rehabilitation and future medical expenses, pain and suffering, as well as various other miscellaneous expenses. As with any personal injury lawsuit, the amount of compensation being sought after is greatly determined by two major components; future costs of care, and loss of future earnings. The Canadian labour force is comprised of roughly 3 million self-employed workers, and reflects nearly 16% of all those employed. By those calculations, in Toronto there are roughly 222,000 self employed workers. 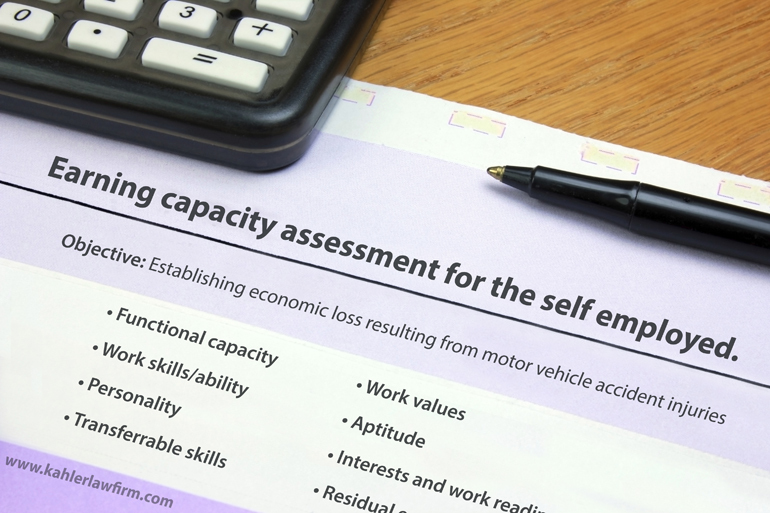 So understandably, its not uncommon for our personal injury lawyers to be confronted with the task of proving past and future loss of earnings for self-employed claimants. The details pertaining to what a self-employed individuals hypothetical financial future would have been; if they had they never been injured – is obviously subjective. For this reason any dollar amount determined is almost certain to be a major point of contention by defence lawyers. Assert the fact that the plaintiff is less able to take advantage of opportunities and is less beneficial to himself as a person in a competitive labour market. Used by personal injury lawyers to establish a self-employed plaintiffs economic loss as a result of an accident injury. A comprehensive document is prepared providing expert opinions on the individual’s education, functional amplitude, work skills/history, aptitude, transferable skills, interests and ability or inability to return to employment. ECA assessments conducted, as part of a defense medical examination will likely focus heavily on the individual’s residual earning capacity or exaggerate the plaintiff’s vocational options and retraining potential. A TSA is an examination designed to explore the types of employment the injured plaintiff may reasonably be eligible for if they are no longer able to perform the duties of their previous position. It is your personal injury lawyers job to present clear evidence on the duties their client is or is not able to perform; and if conceivable – conclude how the injuries sustained in the accident has left them unemployable. The defense counsel on the other hand will look to highlight any residual functional capacities and employment/retraining opportunities to mitigate their exposure to the plaintiffs future financial losses. The role of a self employed persona can be very complex and all encompassing. Roles may be intellectual, supervisory, entrepreneurial or physical in nature. It is very important that your personal injury lawyer acquire the services of an expert in business valuation to quantify true economic damages. The valuator will use forensic analysis tools to analyze profitability, comparable business models, market conditions, competition and trends to support the litigation of your claim. In a perfect world of income loss litigation, the book keeping and tax returns of a self employed claimant would be organized, up to date and a true depiction of the individuals income. This however, is not always the case. It is not uncommon for claimant tax returns when to show limited or negative income. Even when tax returns are not filed; or neglect to report taxable earnings – a claim for financial loss is not out of the question. It does however, make proving the credibility of your claim more difficult. At Toronto’s Kahler personal injury law firm; our lawyers are dedicated to helping self employed claimants recover the personal injury compensation they deserve. Our lawyers have extensive experience representing self employed clients associated with sole proprietorships, trades, partnerships, franchise, limited companies and consultancies.